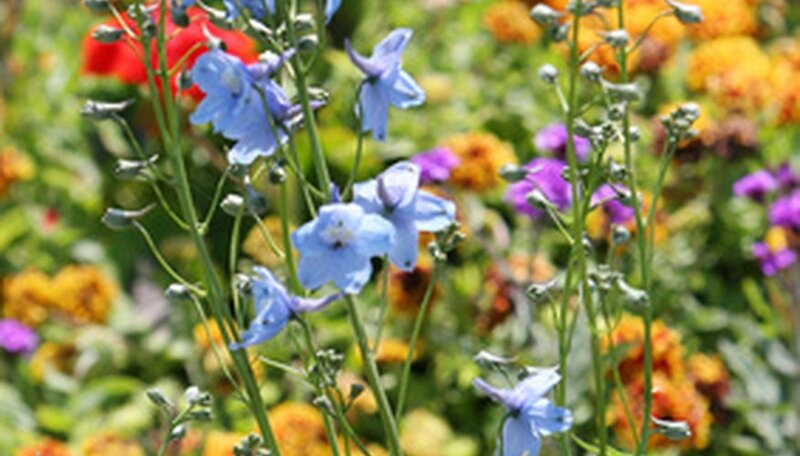 Cool blue flowers are a welcome relief from the pink, red, yellow and orange that commonly populate flower gardens, and dedicated gardeners hunt for blue perennials to balance their garden palette. Although many perennials sport purple or lavender blooms, blue flowers are few and far between. The forget-me-not (Myosotis scorpioides) is a common standby for blue color, but many unique blue flowers exist that add character and impact to a perennial border. A late-spring bloomer, bugloss or alkanet (Anchusa azurea) has bold blue flowers on multiple spikes. It is a tall perennial, growing 4 feet high, but shorter varieties exist such as 'Royal Blue,' which grows to 3 feet, and 'Little John,' which reaches 18 inches. Bugloss grows in a variety of soils but dislikes poorly drained areas of the garden or deep shade. Hardy to USDA zones 3 to 8, bugloss is short-lived but reseeds itself. 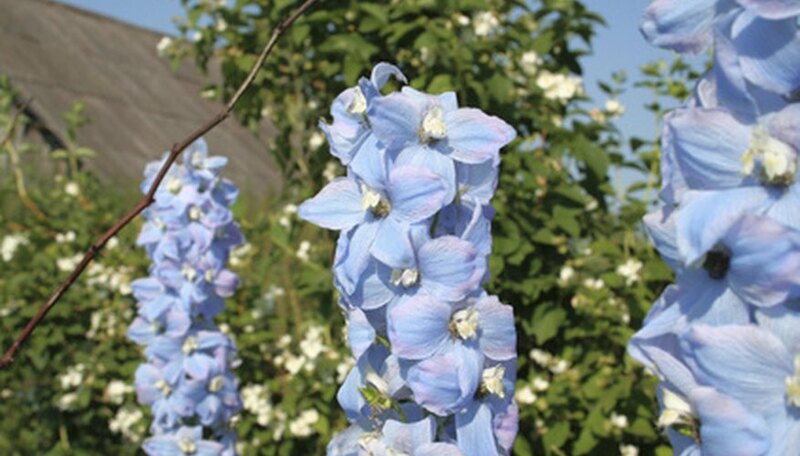 The delphinium variety 'Cliveden Beauty' has soft, sky-blue flowers in summertime that rise on many branching spikes. Unlike many delphiniums, 'Cliveden Beauty' is compact and does not require staking, growing just 2 feet high and as wide. This cottage-garden perennial prefers loamy soil and moderate water, disliking hot summers. 'Cliveden Beauty' prefers USDA zones 3 to 7. 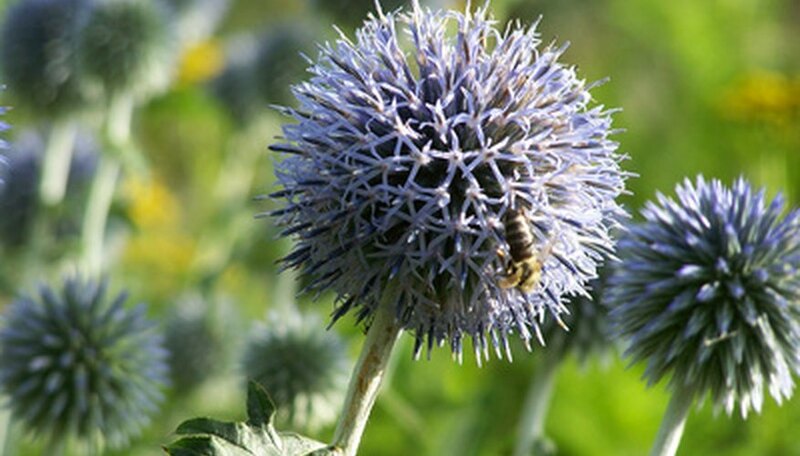 For poor, dry ground in full sun, try a globe thistle (Echinops riro). Although gardeners need gloves around these prickly, tough plants, globe thistles make up for their spikes with a unique, metallic blue seed head. The actual flowers are tiny and short-lived, but the silvery-blue seed heads last two months or more, through summer and into fall. The leaves are dark green with white undersides and have deep cuts. Globe thistles grow up to 4 feet high and 3 feet wide, need little care and are hardy in USDA zones 3 to 9. Also known as bluebeard or blue spirea, blue mist (Caryopteris x clandonensis) adds powder-blue color from late summer to frost. Drought-resistant and sun-loving, blue mist is actually a low-growing, twiggy shrub, but its compact size, contrasting silvery-green leaves and mounded shape suits a mixed-flower border. Blue mist plants grow 2 to 3 feet tall and do well in USDA zones 6 to 9. Prune these perennials in early spring, before flower buds form on the new growth.